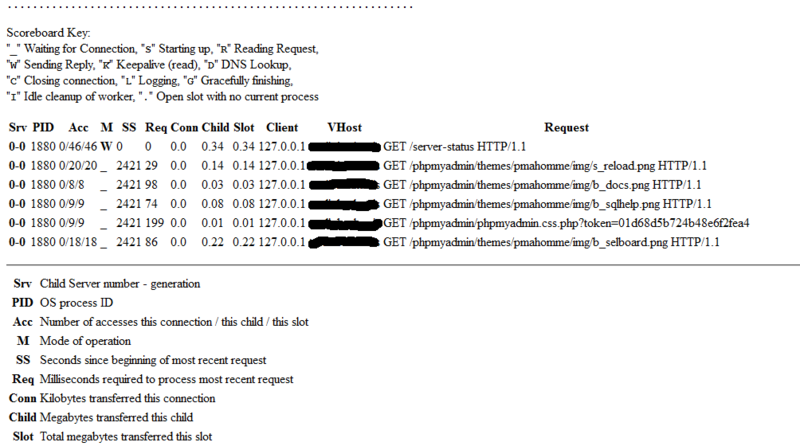 Apache 2 has a nice feature to allow a server admin to view the performance of Apache. When mod_status module is enabled an HTML page will be presented to allow stats to be presented in a readable format in which refresh can be set. Enabling the module is easy and can be done on Apache running on Windows and other Unix / Linux systems. First lets open the Apache configuration file httpd.conf. and un-comment or add it. Next we need to add the ExtendedStatus variable and set it to On, the default setting is Off. Note: This setting applies to the entire server, and cannot be enabled or disabled on a virtualhost-by-virtualhost basis. The collection of extended status information can slow down the server. 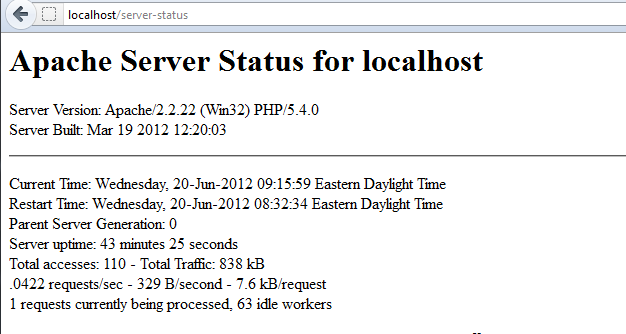 Now we need to add the server-status site to Apache. You can create a virtual host for the server object and store it in the conf.d or you can just add it to the httpd.conf, the choice is yours. Save the httpd.conf file and restart Apache, make sure to test the config changes before restarting. 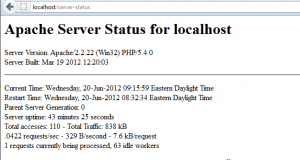 Open a browser and open http://servername/server-status and you should be directed to Apache Server status page. As you can see there is plenty of good information on the performance of the server as well as another problem determination tool. You can get the status page to update itself automatically if you have a browser that supports “refresh”. Access the page http://your.server.name/server-status?refresh=N to refresh the page every N seconds.